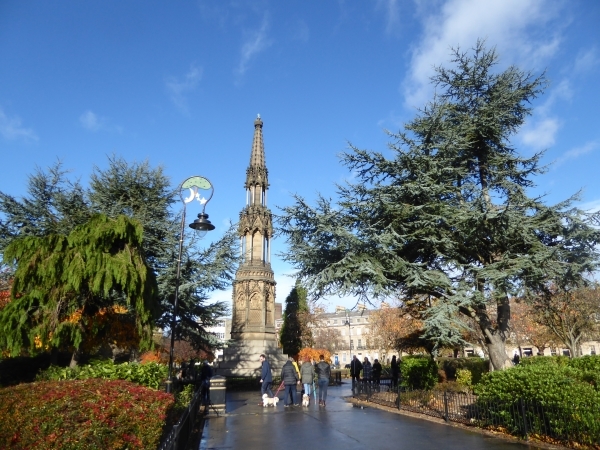 Not much wildlife today, because we attended the Remembrance Service in Hamilton Square, Birkenhead. 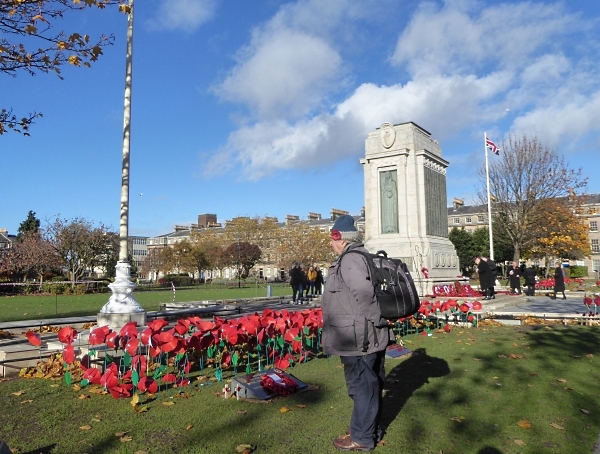 So often we have wet or freezing Remembrance Days, but it was brilliantly sunny, with just a chilly breeze. Half way through the service one of the Peregrines that nest on the station tower flew right past the Cenotaph, as if checking what all the unusual activity was about. Afterwards we admired some of the trees in the square. 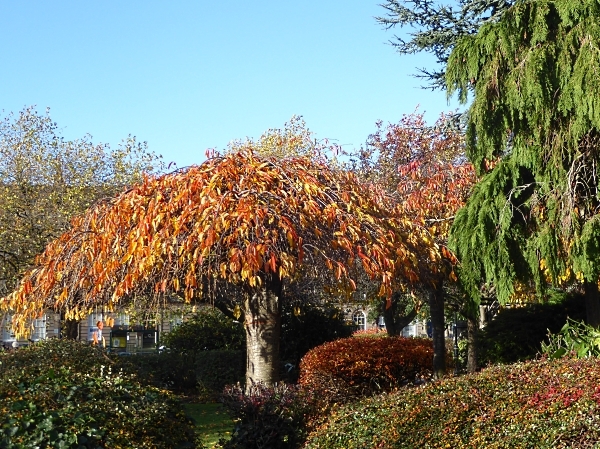 On the south-east side of the central monument is a pair of Blue Atlas Cedars, and they also have some gorgeous weeping Cherries, in lovely autumn colour just now. 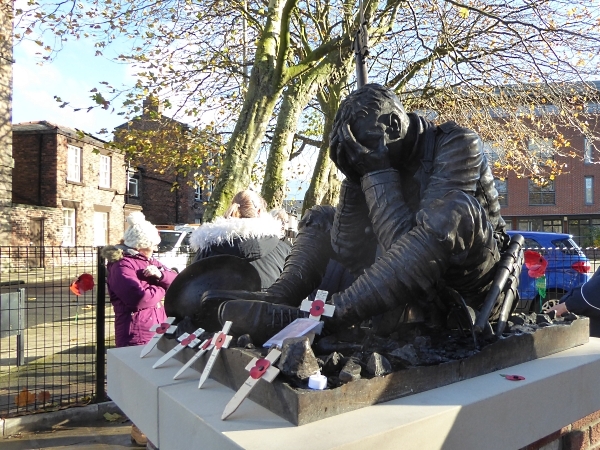 At the corner of Hamilton Street and Duncan Street is a new statue honouring the WWI poet Wilfrid Owen, who went to school in Birkenhead. The statue isn’t meant to be of him, but illustrates his poem “Futility”, and is unusual because the soldier depicted isn’t being heroic. 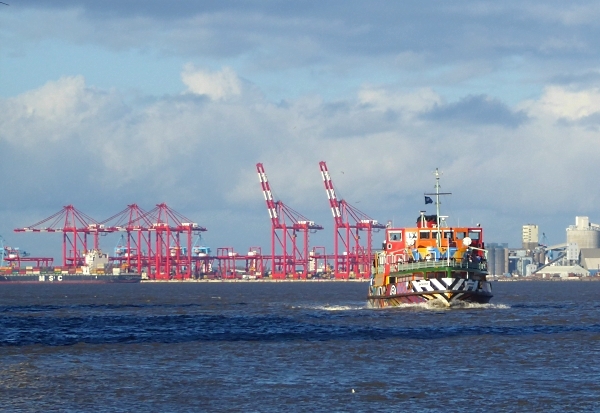 Then we trotted down to Woodside Ferry, admired the view over to Liverpool, and caught the razzle-dazzle ferry home. A couple of other tree notes. 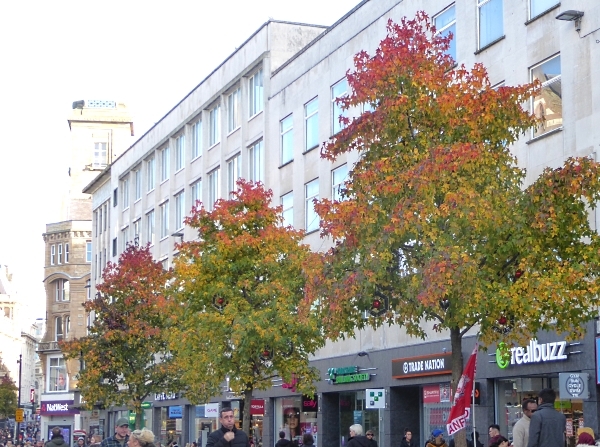 The Sweetgums Liquidambar styraciflua in Lord Street and Church Street are just starting to turn red at the tops and should be spectacular in the next week or two if there are no high winds to strip them. 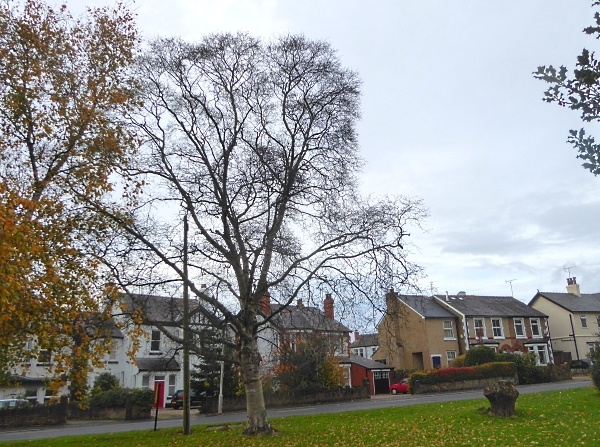 On Saturday, I went looking for a very rare tree, the River Birch Betula nigra said by John Moffat in his essay “Great Trees of the Wirral” (see MNA newsletter end 2013) to be “on a traffic island” in Heswall. I think this is it, at the junction of Telegraph Road and Thurstaston Road. 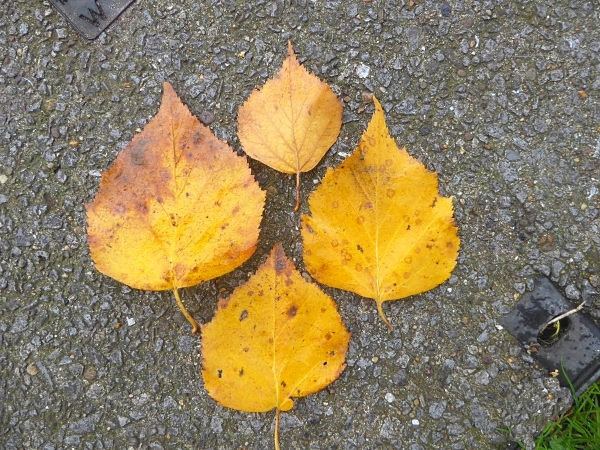 The fallen leaves, “elegantly doubly-toothed” match the picture in Mitchell and there were birchy-looking catkins developing on the branches. Public transport details: Train at 10.30 from Central, arriving Hamilton Square station at 10.35. Returned on the 1.40 ferry from Woodside.